British Ornithological Union The British Ornithological Society. Publisher of The Ibis. Birdnet.de German homepage for birdwatchers, breeders and ornotholigists. in german only ! Deutschen Ornithologen Gesellschaft The oldest ornithological society of the world ! Vogelruf.de Translate bird names to Latain, English, German, French, Dutch, Italian, Russian, Spanish and Swedish. Woodpeckers A beautiful site ! Hirundorustica Anders Pape Møller has studied the Barn Swallow since 1982! British Museum of Natural History 70 million natural history specimens. The Handbook of the Birds of the World The Handbook of the Birds of the World (HBW) is the first work ever to illustrate and deal in detail with all the species of birds in the world. Wildside Books A large natural history antiquarian and new natural history books with a fine catalogue. 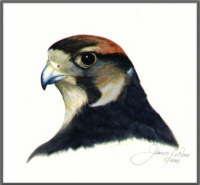 Welcome any enquiries for commissioned art work on birds of southern Africa.